So a couple of days ago I introduced you to the new Simply Strings book by Rana Heredia and today I wanted to show you my finished project from the book. This is Twinkle Toes! The finished quilt measures 41” x 41” and is made up of two different types of string blocks – what Rana calls “random string blocks” and “classic string blocks”. 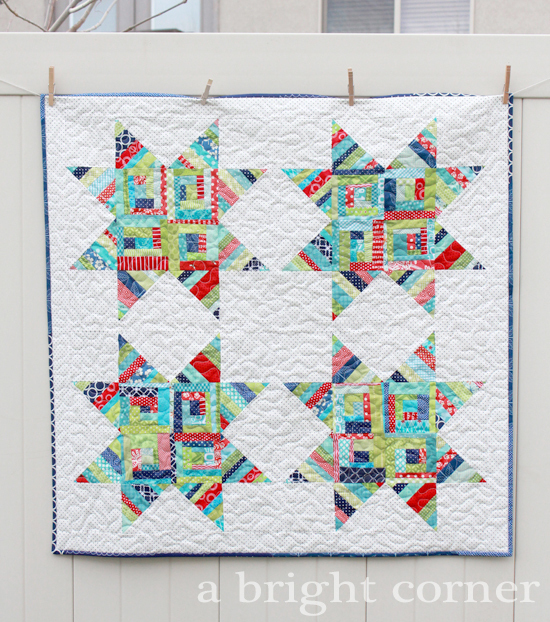 In the past when I’ve made string blocks (like for this quilt) I just used regular printer paper for my foundation. This time I wanted to try a new (to me) product called Stitch n Sew EZ Print Quilt Block Sheets. Each sheet measures 8.5” x 11” which fits nicely into your home printer. If you need to print out your foundation pattern you can do it right onto the sheet. In this case, I needed both 5” and 5.5” squares so I just cut the sheets down to size. You can see in the photo below how thin each sheet is, and how easily you can see through it (that's important when you're doing paper piecing.) However, when you’re working with it, it doesn’t FEEL thin. It’s sturdy, yet flexible and easier to sew through than my usual paper is. As you add each layer to your string block you press each one in place. The foundation sheets cause no problems here either. In fact, sometimes when I use paper I find that the paper can tear away from the back before I want it to, which can cause problems when trimming and squaring up the blocks. As I was making this quilt, I would sit for awhile and make quite a stack of blocks before heading to the cutting table to trim them down. It really sped up the process. Then later I sat and watched some classic Star Wars with my boys as I tore off the foundation papers. They tore easily and neatly, leaving no bits behind like paper can sometimes. Once I had all of the blocks made, I was ready to put together the quilt top. 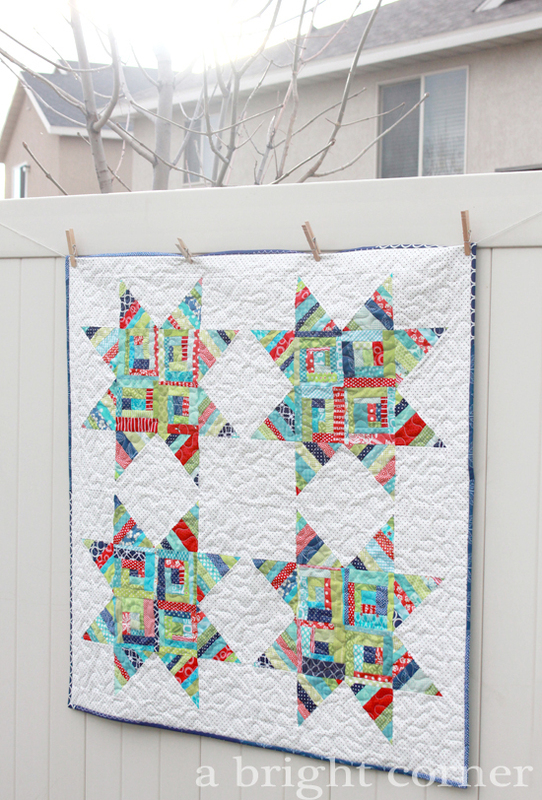 It was such a fun quilt to make – I really wish I would have added a few more blocks to make a throw size! Here's one of the finished blocks. The dot print used as the background is Essential Dots from Moda (Black on white yardage) and is one of my favorite low volume background prints. As I finished the quilt, I thought it was just begging for a binding that was as fun and scrappy as the top was. To bring some order to the chaos, I chose to just use all blue scraps. Perfect - just the look I was going for! That quilt is so cute!! And I totally need to try some of those quilters sheets. I hate tearing paper from the back!! I love your quilt Andy! I love it! the colors are very appealing. I love it Andy! Your colors are always striking! That was one of my favorite projects in the book too! And thanks for introducing me to the EZ print sheets. Those look great! Soooo cute! So happy I won the book...thank you for showing this. I love your work! Your quilt is awesome. Lovely colors on that pin dot background which is just perfect BTW.